The strategies adopted by governments and public officials can have dramatic effects on peoples' lives. The best ones can transform economic laggards into trailblazers, eliminate diseases, or sharply cut crime. Strategic failures can result in highly visible disasters, like the shrinking of the Russian economy in the 1990s, or the aftermath of Hurricane Katrina in New Orleans in 2005. This book is about how strategies take shape, and how money, people, technologies, and public commitment can be mobilized to achieve important goals. It considers the common mistakes made, and how these can be avoided, as well as analysing the tools governments can use to meet their goals, from targets and behaviour change programmes, to innovation and risk management. 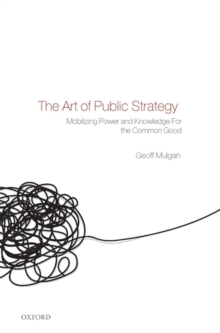 Written by Geoff Mulgan, a former head of policy for the UK prime minister, and advisor to governments round the world, it is packed with examples, and shaped by the author's practical experience. The author shows that governments which give more weight to the long-term are not only more likely to leave their citizens richer, healthier, and safer; they're also better protected from being blown off course by short-term pressures. The book is essential reading for anyone involved in running public organizations - from hospitals and schools to national government departments and local councils - and for anyone interested in how government really works.